When I first heard about the TCM Discoveries Blogathon hosted by Nitrate Diva only one film really came to mind: A Wicked Woman. Probably the first cinematic white whale I had was Satantango. Now, that was a blind buy. I heard of this seven-hour film and what it was like and I had to see it. But that was a blind buy. With A Wicked Woman the story of estrangement of viewer and film is a bit different. The first difference is that it’s a film I’ve seen. I believe it’s one I happened to see pop up on the schedule right before I was about to post my piece on Jackie Searl. It lived on my DVR for a while until the time came for it to be swapped out. The content could not be saved and I haven’t seen it on the TCM schedule since despite looking for it periodically and inquiring also. Therefore, the limited availability of the film makes this a post that would also fit into my Film Activism category. I’ll get into that as well as how it may resurface again aside from TCM re-air. Clearly, I am glad TCM saw fit to air this fairly obscure title, otherwise, I would not have seen it at all. Before getting into the journey since I saw it. A bit of what this film actually is. When her abusive, rum-running husband Ed storms into their Louisiana bayou shack one night, hotly pursued by the sheriff, pregnant Naomi Trice refuses to allow him to flee with their son Curtis. Determined to take Curtis, Ed knocks Naomi to the floor and tries to force his way to the boy’s bed, but is shot and killed by Naomi. After dumping Ed’s body in the swamp, Naomi gives birth to a boy, Neddie, whose leg is misshapen because of Ed’s abuse. The sheriff, whom Ed had shot while escaping, questions Naomi about her husband, but she refuses to reveal her deed. Later, she makes a pledge to God that if she is allowed to rear all of her children–Curtis, Yancey, Roseanne and Neddie–safely into adulthood, she will give herself up and pay the consequences of her crime. Naomi then moves her family away from the swamp and the still suspicious sheriff, changes her name to Stroud and eventually settles in a small Northern town. Despite the cause of the leg abnormality, which may fall more of the category weird science than real science, there’s a lot to glom on to that makes this brisk, taut tale one worth watching: an abused wife and child easily engender universal sympathy; however, what sets this film apart is Naomi’s willingness to turn herself in when the time comes. It’s not seeking to get away but rather buying time. The film then survives an abrupt jump in time of ten years. This is quite a feat because regardless of when it happens this can be jarring, particularly in a tale with young characters, and with so much time passing, things can change and not always for the better and the new complications don’t always work as well as the set-up. However, the film’s usage of secrets, and motherly responsibility, provide renewable and palpable drama and lead to a thrilling and satisfactory finale. Ever notice these titles released immediately after Code enforcement, those from the last half of 1934 and even into ’35, are still a bit rougher than what follows? Take away the Production Code Administration banner at the front of A Wicked Woman and I’d have thought it was a pre-Code release. Like many films produced in that era, it was an adaptation of a contemporary novel. 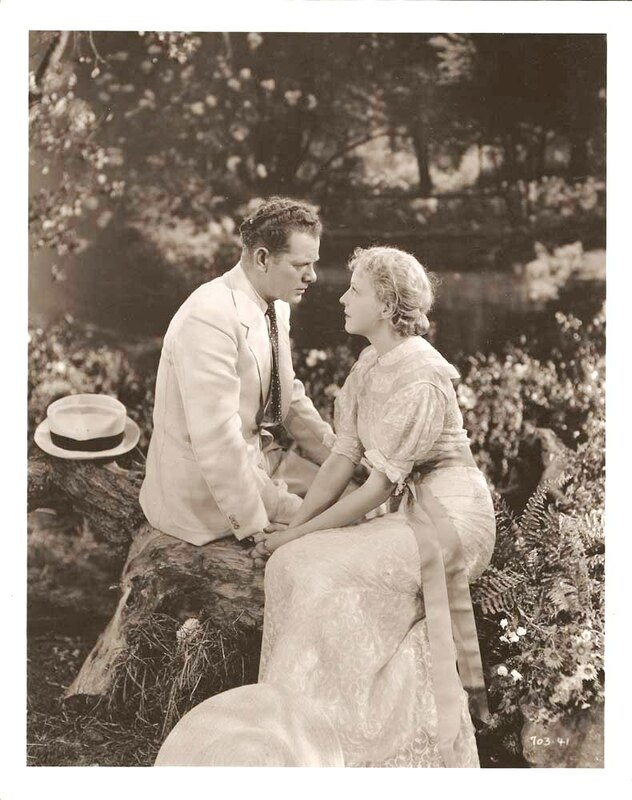 A Wicked Woman by Anne Austin was released in 1933 and though out of print today is cited as having been 376 pages, which makes a feature under eighty minutes that works quite a screenwriting feat. Eventually, in the murder trial which clears Naomi, Miss Austin gets back to her own stuff, and does it very well. Melodrama, perhaps, but there is a strong human interest element which gives it dignity. Though the film didn’t end up being one of the highest grossing films of 1934 (Per reports it failed to earn back its budget) or land on any lists it was a popular enough book for MGM to option and adapt in short order. Yet Miss Christians wades into this ponderous drama with such genuine sincerity and skill that it becomes not only credible, which is a feat in itself, but impressive and considerably touching as well. Somehow in its description of Naomi’s latter-day household, the children growing up into the pangs of adolescence while the mother watches their development with patient and self-effacing pride, the photoplay comes to have a surprising freshness and conviction. Always you are aware that the work is marshaling all its forces for an unashamed assault upon the tear ducts, but you also discover that its assault is a success, and you find yourself helplessly engrossed in this woman’s courage and devotion. In addition to Miss Christians’s virtuoso performance, there is an almost flawless cast to assist her. Also available on TCM’s site that is of note is that three different running times are listed 71,74 and 76. I’m not sure if this means there was content cut but I believe the one TCM aired was the longest such cut. When available I’ve requested airings, tried to set reminders, and shown interest in a DVD. Although reviews claim that Mady Christians, a well-known German stage and screen actress who had worked at Ufa’s Berlin studios, made her American screen debut in A Wicked Woman, modern biographical sources note that Christians actually had starred in a 1916 American film, Audrey, under the name Margarete Christians (see AFI Catalog of Feature Films, 1911-20; F1.0179). Christians moved to the United States in 1933 to escape persecution by the Nazis. Her most celebrated role was as the title character in the 1944 Broadway play I Remember Mama. Shortly before her death in 1951, Christians was blacklisted by the Hollywood community for her reputed involvement with the Communist party. 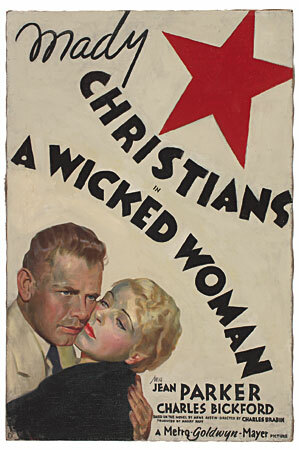 A Wicked Woman was screenwriter and actress Zelda Sears’s last film. She died on February 19, 1935. 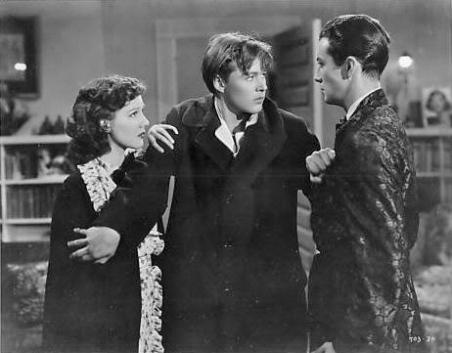 According to a Hollywood Reporter news item, Sears, who occasionally appeared in pictures she scripted, had been reluctant to act in this film. 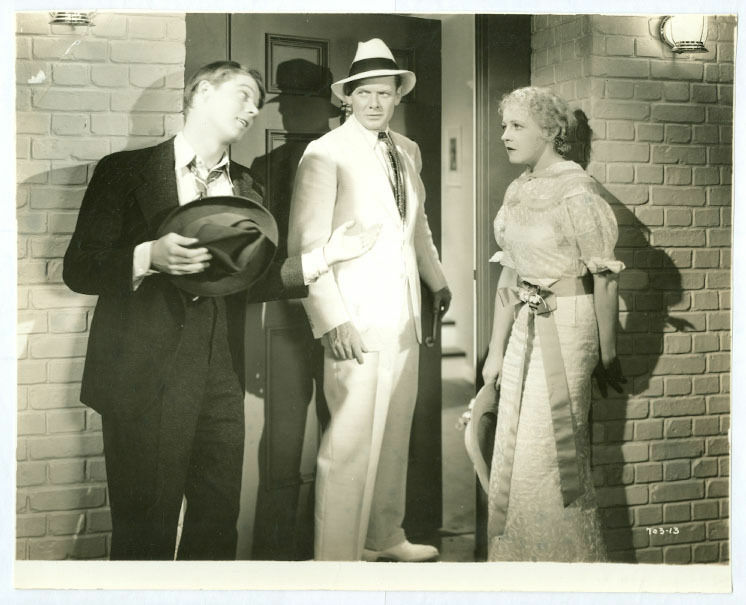 Early pre-production Hollywood Reporter news items announced first that William K. Howard was to direct Helen Hayes in the film, and then that Clarence Brown was to direct Hayes and Lee Tracy. None of these directors or actors worked on the production, however. A Hollywood Reporter pre-production news item announced that Erskine Caldwell was assigned to write dialogue for the film, but his contribution to the final film has not been determined. Hollywood Reporter production charts add Benny Baker and Joe Twerp to the cast, but their participation in the final film has not been determined. 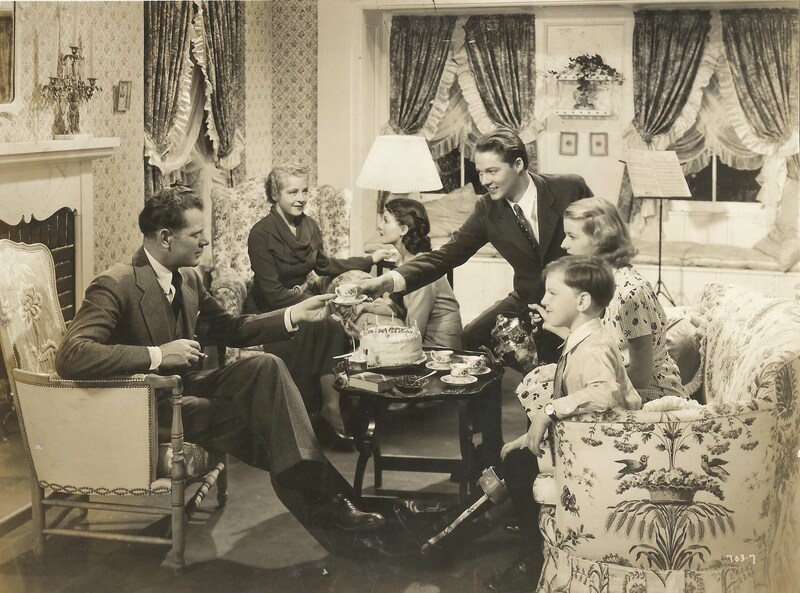 Although Hollywood Reporter news items announced that Christians was to sing “In the Hash,” a “novelty song” by Burton Lane, as well as “Swing Low, Sweet Chariot,” the only song actually performed in the movie was Lane’s “In Louisiana,” which was sung by an all-black group. 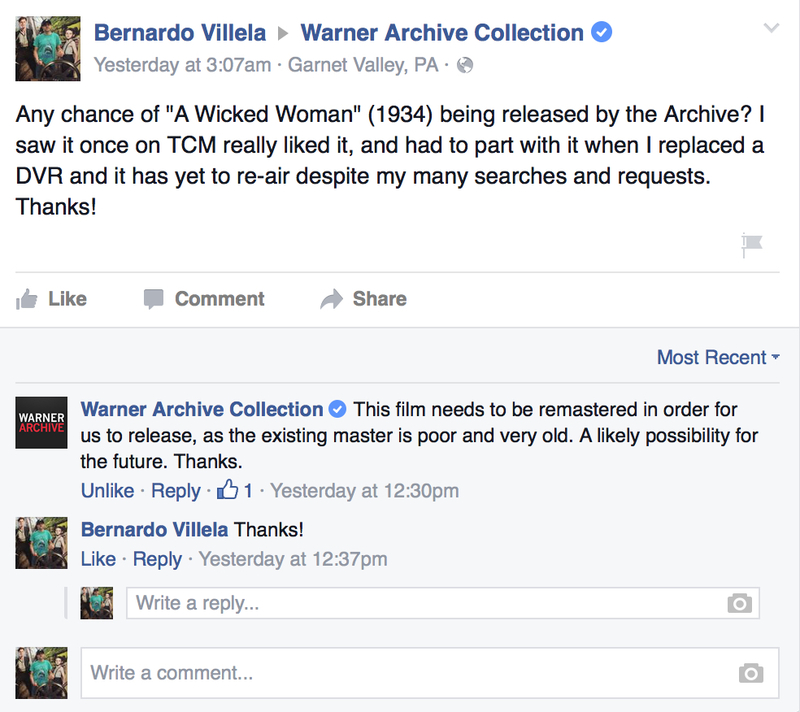 So it’s a possibility that this film will be released by the Archive eventually. Therefore, I recommend that if you’ve seen it you like the post, or comment it, if you haven’t be on the lookout on TCM as it may pop up again. Quite frankly finding films like A Wicked Woman is what TCM is all about to me. Some classics are so universal and immortal if you love movies enough you’ll find a way to see them. A channel like TCM will bring you the things you may not have even known existed much less thought to see, and that’s a great thing.